Wonderful Kavieng Market, New Ireland province, is one place where you can find the tastiest sea food and freshest vegetables. The main Kavieng Market is situated on the foreshore and is a central hub of activity most days of the week, except Sundays. There is a fantastic variety of locally grown fruits and vegetables, fresh and smoked fish, live mud crabs, baskets of sunga and kina shells, and of course plenty of buai. Also found in large quantities are huge trays of tapioca slice made with coconut milk, sago slice, donuts, rice balls and other local delicacies. While in Kavieng from last Thursday till Sunday, I took a stroll down to the market from my hotel almost every day, and ate smoked fish, kina shells, tapioca, sago and other local delicacies to my heart’s content. Although generally a produce market, you will also find woven baskets, locally printed laplaps, and handmade bilums available for sale. Captions: 1. Promoting self help – Raising goats in the valley. There are currently over 500 goats in the valley. 2. In a semi permanent church building self funded by elites. 3. New church building. The rural Warakamb Valley in Kandep district, Enga province, has decided to put its old ways behind and embrace change. Sandwiched between Enga and Southern Highlands provinces, it is very remote. The unreliable Mendi-Kandep Highway goes through the Warakamb Valley. The valley was first discovered in the late 1940s. The first missionaries were Anglican and Catholic priests who decided to settle there. They set up schools, a mission station and cattle farms. However, after the 1975 Independence and continued nagging by the locals, the Catholic missionaries packed up and left. There was a vacuum left. Then the Seventh Day Adventists (SDAs) moved into the valley. The local people, having recognised their foolishness, embraced the SDA mission. Never did they know the blessings that will come later. Despite that, trouble fights started to erupt here and there. Nearby tribes went to war causing much destruction. People were killed and thousands of kina worth of property was destroyed. Weapons started to become more and more sophisticated. The rules of law were no longer existent. Meanwhile, the SDA church had started to use community school leavers of the previous years to train them into laymen missionaries to spread the word of God. There were more than 10 of them. They worked hard and the dividends paid off. Most went on to become pastors. 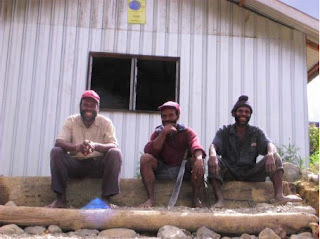 They excelled in their work, baptising many people and spreading the Good News throughout the PNG Highlands. The Lord blessed them with children who excelled in their school work. Some have now finished university studies to work as lawyers, accountants, architects, doctors, dentists, nurses, teachers, geologists and so on both in PNG and abroad. Combined with other SDA students from the valley who had excelled, and with missionary’s kids and the local people, they have formed an association called The Warakamb Adventist Elite and Clergymen’s Association Inc (WAECA). WAECA was formed in 1998 and registered with the PNG IPA in 2001. It was formed to continue to spread the Word of God and promote peace and prosperity in the Warakamb Valley. Since its establishment, many people have been baptised. The valley has seen a dramatic decrease in tribal fights and people are very hesitant to start any wars. The fact that WAECA is a non-political association means that the elites and clergymen can work with any MPs who are elected into parliament. Currently WAECA elites are helping two local MPs from Kandep and Mendi, and are available free of charge to any local people who need help. Self-help projects including goat projects and tree planting have been initiated in the valley. All these and other information can be found on their web site http://www.waeca.com . Since the launch of their website, compliments were sent from all over the world including Australia and the US, as this was one of the first of its kind from the developing world. Their other main activities include the areas of HIV/AIDs and climate change. WAECA continues to hold its conventions once every two years. 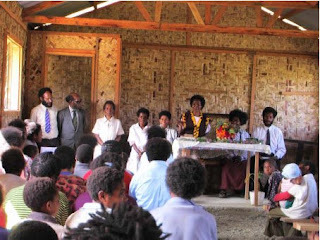 Elites form all over PNG and abroad converge in a selected village in the valley to help spread the gospel, promote law and order, talk about world events, give talks on HIV/AIDs, climate change, show gospel movies on huge screens and promote self-help activities. Some of the self-help projects include three new church buildings, an aid post, tree plantations and few others coming up. The local people are well versed with major events in the world. Their next convention will be held from December 28th, 2008 to January 4th, 2009, and runs for a week. Many people are expected to attend including guests and visitors from all over the country. A fund raising dinner is being organised for December 6 at the Hideaway Hotel in Port Moresby, and invitations will be soon be sent out. Money raised will be used to run conventions, build churches buildings, pay laymen and pay for other socio- economic activities. Already two MPs have promised a health centre, a school, and other government services. WAECA’s motto is “Together we serve”. For further information, contact: info@waeca.com or Joe- PR officer on 72689831 or Jack Assa on 72669451. Feel free to browse through their website http://www.waeca.com . Wonderful Kavieng, New Ireland province, is the ideal place to visit as I found out during a visit last week. I especially loved the scenic and unspoiled beachfront, market and the long and winding Boluminski Highway. The market, especially, is one place where you can find the tastiest sea food and freshest vegetables. The highway is named after German administrator, Franz Boluminski, who landed at Kavieng on June 30, 1900, with his wife Frida. He supervised the task of building a road, and in less than four years, 100km was built using karanas (dead coral) that is in plentiful supply. Boluminski gained widespread respect for establishing peace on New Ireland; however, it is for the highway that his name lives on. His tough but fair dealings with natives and whites alike in New Ireland were frequently referred to by visiting Germans as “the South Sea Pearl of German colonial possessions”. Boluminski had built a fine residence on a ridge with a grand staircase descending to the harbour with extensive gardens. A post office was established in 1904 and overseas vessels were visiting Kavieng by 1912. He died on April 28, 1913, and is buried at Bagail cemetery in Kavieng. At the time of Boluminski’s death, a fine road capable of being used by the new motor vehicles just arriving stretched 165km from Kavieng carrying produce to port and facilitating the administration by strategically-located government rest houses. It was the longest and best road in the Pacific until the 1950’s. Of course, you can’t say anything about Kavieng and New Ireland province without mentioning the Chinese, who were brought to Kokopo and then Kavieng in the late 1800’s, inter-married with the local women, and their legacy lives on to this day. It has often been described as the typical “Somerset Maugham South Sea island port”. Kavieng is a sleepy little town with a golf course, a range of restaurants, bars and facilities, including banks, supply stores, bakeries and supermarkets. Places to stay include, hotel, guest house and resort style accommodation, while easy going traditional style bungalows are situated among the islands just offshore. Visitors should not expect to come to Kavieng to experience an abundance of cafés or restaurants, shopping strips and nightclubs, as they will be very disappointed. In addition to the Kavieng Market, there are a variety of kai bars in Kavieng where you can pick up a cheap local-style feed. The Kavieng Hotel has a bar, complete with pool table and satellite TV, and a garden setting restaurant which is open every day of the week for breakfast, lunch and dinner. The Kavieng Hotel, however, is famous for its Friday Night Seafood Buffet with what seems like an unlimited amount of mud crabs and crayfish, as well as plenty of fish and other seafood, salads and vegetable dishes. The Kavieng Club has a large bar and a billiard room, and is a relaxing place for a drink after a game of golf on their nine-hole golf course or a quick snack for lunch or dinner. The Malagan Beach Resort is perfectly situated on the beachfront, and its outside pool decking area is an excellent place to watch the sun set whilst enjoying a drink from their bar. Its restaurant is open for breakfast, lunch and dinner and extends outside to a shaded patio area on the beach. Sunday night is BBQ Night at the Malagan. The bar has a great selection of local and imported spirits, an excellent wine list, and an extensive cocktail list. Nusa’s restaurant is open for breakfast and lunch with a good selection to choose from off their menu, with buffet dinners available every night of the week, specialising in the areas fresh seafood and vegetables. Sea breezes keep Kavieng cool and it’s a pretty and peaceful place to wander around, with very friendly and welcoming people. I spent a couple of days in Kavieng for the National Fisheries College graduation and thoroughly enjoyed every minute of my stay. I'm planning to go back very shortly, and who knows, might even buy a piece of land in this part of Paradise. Captions: 1. 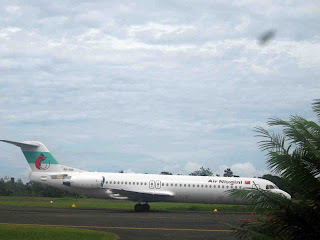 Air Niugini F100 arrives at Kavieng airport 2. 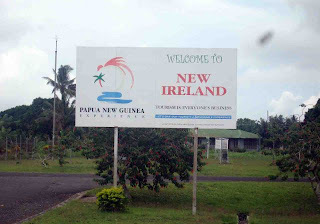 Welcome to New Ireland signboard. 3. 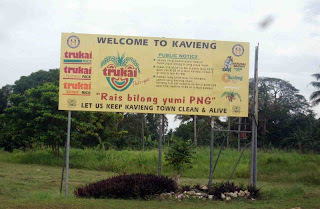 Welcome to Kavieng signboard. "A NEW COMMITMENT TO ASIA-PACIFIC DEVELOPMENT"
We, the Economic Leaders of the Asia-Pacific Economic Cooperation (APEC) forum, gathered in Lima, Peru, under the theme: “A New Commitment to Asia-Pacific Development”. The theme chosen for APEC 2008 highlights the importance of reducing the gap between developed and developing member economies. We are committed to strengthening the social dimension of globalization and ensuring that all members and all sectors of our economies can access the skills and opportunities to participate in, and benefit from, regional and global trade and investment. The current global financial crisis is one of the most serious economic challenges we have ever faced. We will act quickly and decisively to address the impending global economic slowdown. We welcomed the monetary and fiscal stimulus provided by APEC member economies and will take all necessary economic and financial measures to resolve this crisis, taking the necessary actions to offer hope to those most in need. Our resolve to address the deteriorating global economic situation, and support a prompt, ambitious and balanced conclusion to the WTO Doha Development Agenda (DDA) negotiations, is outlined in a separate statement issued at this meeting. Last year we agreed to an ambitious long-term agenda to strengthen regional economic integration. We welcomed the 2008 progress report from Ministers and officials on efforts to achieve this goal. We endorsed the 2009 work plan for the APEC Regional Economic Integration (REI) Agenda in order to build upon this year’s accomplishments on REI and to accelerate efforts in all areas of this agenda. · welcomed progress made by member economies towards the Bogor Goals of free and open trade and investment in the Asia-Pacific region. We reinforced our commitment to achieving the Bogor Goals to promote growth, development and a rapid recovery from the current global slowdown. · we commended the progress made in examining the prospects and options of a possible Free Trade Area of the Asia-Pacific (FTAAP) as a long-term prospect. We noted advice from Ministers that while an FTAAP would likely be of economic benefit to the region as a whole, there would also be challenges in its creation. We instructed Ministers and officials to undertake further steps in examining the prospects and options of a possible FTAAP, including by conducting further analytical work on the likely economic impact of an FTAAP, and discussing the possible capacity building requirements for any possible future negotiations. In addition, we instructed officials to undertake initiatives designed to promote greater convergence among economies in key areas of APEC’s trade and investment portfolio, including areas such as customs administration, trade facilitation and cross-border services. · welcomed five new model measures, resulting in a set of 15 completed chapters for Regional Trade Agreements (RTAs) and Free Trade Agreements (FTAs) that will promote high-quality RTAs/FTAs and greater consistency and coherence among these agreements in the region. · endorsed the continued process of implementation of APEC’s second Trade Facilitation Action Plan (TFAP II) to achieve our stated goal of reducing trade transaction costs by an additional five percent between 2007 - 2010. · welcomed the APEC Investment Facilitation Action Plan (IFAP) to improve the investment environment in the region and commended the initiation of the study of bilateral investment agreements and core-investment-related activities of existing free-trade agreements. · emphasized the importance of strengthening financial markets in the region and welcomed the capacity building activities initiated by APEC Finance Ministers to reform capital markets. We recognized the pressing need for infrastructure development in APEC economies and welcomed the work undertaken by Finance Ministers on linkages between private public partnerships and capital market development. In this regard, we called on Finance Ministers to examine more fully the means to optimize linkages between private infrastructure finance and growth and development. · reaffirmed our commitment to strengthen the protection and enforcement of intellectual property rights (IPR) in the region, and reiterated the importance of comprehensive and balanced IPR systems that provide for and protect the incentives that encourage creation and innovation. We will continue to promote greater collaboration among our IPR experts and enforcement authorities. · we welcomed the progress by economies to implement the APEC Anti-Counterfeiting and Piracy Initiative as well as efforts to improve patent systems in the region and look forward to further progress in this area next year. · welcomed the Digital Prosperity Checklist as an important tool in APEC´s efforts to promote sustained economic growth through the use and development of information and communication technologies. We welcomed the views and work carried out by the APEC Business Advisory Council (ABAC) on improving the business environment, and called for an active participation of small and medium enterprises (SMEs) in the REI agenda. We asked Ministers and officials to continue the implementation of the REI Agenda as outlined in the progress report and report back to us in 2009 with a summary of steps taken to promote this agenda. Noting the increased economic integration in the region, we also discussed Australia´s suggestions on how regional architecture can keep pace with changing circumstances. We agreed that our Leader’s Agenda to Implement Structural Reform (LAISR) is a central element of APEC’s agenda, integrating the three pillars of trade and investment liberalization, business facilitation, and economic and technical assistance and cooperation. We reiterated the fundamental importance of tackling ‘behind-the-border’ barriers to trade and investment in the creation of well-performing, resilient and robust economies. We welcomed the outcomes of the Structural Reform Ministerial Meeting (SRMM), held in Melbourne in August 2008 and noted the endorsement by Ministers of APEC’s Good Practice Guide on Regulatory Reform. We recognized the importance of developing a program of practical support for member economies to successfully undertake structural reform. This includes capacity building initiatives in the areas of regulatory reform, corporate governance and other LAISR areas. We encouraged active participation in the voluntary system of peer or self-review of our economies’ efforts to implement structural economic reform. We welcomed publication of the annual APEC Economic Policy Report and the accelerated work plan for Private Sector Development endorsed by Trade Ministers in June. We are deeply concerned about the impact that volatile global food prices, combined with food shortages in some developing economies, are having on our achievements in reducing poverty and lifting real incomes over the last decade. The poor are especially vulnerable to increases in food prices. We support a fully coordinated response and a comprehensive strategy to tackle this issue through the Comprehensive Framework for Action developed by the United Nations (UN) Task Force on the Global Food Security Crisis. We will support the application and implementation of this Framework within the region, as appropriate. Individual and collective policy responses to expand food and agricultural supply in the region should strengthen market forces to encourage new investment in agricultural technology and production systems. A prompt, ambitious and balanced conclusion to the WTO DDA negotiations would deliver substantial improvements in market access and reduce market-distorting measures in global agricultural trade. We commended the work that APEC has undertaken in the area of food and agriculture, and welcome the work plan endorsed by APEC Ministers to refine and strengthen APEC’s agenda to meet current and emerging food security challenges. We also recognized the role of ABAC in raising the importance of food and agricultural issues on the APEC agenda. 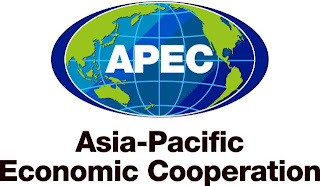 We directed APEC to increase technical cooperation and capacity building that will help foster agricultural sector growth, including efforts to increase food production; improve agricultural education; enhance natural resource management; promote the development of next generation biofuels made from non-food materials; build well-functioning markets and regulatory institutions; and make food storage, transportation, and distribution systems more efficient. We pledged cooperation to bolster conditions conducive to promoting agricultural research and development. We directed APEC to help member economies develop science-based regulatory frameworks to benefit from the potential of agricultural biotechnology. We stressed that globalization based on economic, social and environmental progress can bring sustainable benefits to all APEC economies, their business sectors and their people. CSR can reinforce the positive effects that trade and investment have on growth, competitiveness and sustainable development. We encourage responsible and transparent business conduct that adheres to local legislation and regulations and takes into account guidelines related to CSR that have been developed by multilateral bodies, as appropriate. We agreed that given increasing expectations amongst global consumers, investors and business partners regarding responsible and sustainable business practices, the voluntary activities that comprise CSR will remain an important aspect of doing business in the 21st century. We recognize that all stakeholders in our communities benefit when governments foster a business environment that encourages voluntary CSR practices. This will create greater value both for businesses and for the societies in which they function. We welcomed the work that has been undertaken within APEC to promote CSR awareness and capabilities in the region, and future work that will encourage dialogue on CSR among relevant stakeholders including: businesses, governments, employees, communities, consumers, investors, and non-governmental organizations. We recognized ABAC’s efforts in promoting CSR awareness and uptake in the region through the dissemination of information regarding CSR principles, practices and benefits. We encouraged companies to incorporate CSR into their business strategies to take account of social, labour and environmental concerns. The development of CSR in the region will depend on the different domestic economic, social and cultural context of APEC members. We agreed to promote CSR practices in APEC economies on a voluntary basis in business operations of all sizes to complement public policies that foster sustainable development. Corruption in both the public and private sectors is a serious threat to social and economic development in the region. We recognize that when criminal entities collude with corrupt public and private sector officials, it results in a culture of impunity and financial exploitation of the legitimate economy. We agreed to leverage our collective will to combat corruption and related transnational illicit networks by promoting clean government, supporting public-private partnerships, fostering market integrity, and transparent financial systems. We recognize that the criminalization of corruption can facilitate greater regional cooperation. In support of our earlier APEC anti-corruption commitments, we commend efforts undertaken by member economies to develop comprehensive anti-corruption strategies. These include efforts to restore the public trust and protect against the abuse of our financial system through financial intelligence and law enforcement cooperation related to corrupt payments and illicit financial flows. These anti-corruption activities through APEC are consistent with the UN Convention Against Corruption (UNCAC), which we encouraged economies to ratify and implement, where applicable. We also supported the revised Financial Action Task Force (FATF) recommendations, where appropriate. We welcomed the Lima Anti-Corruption Declaration on Financial Market Integrity through Effective Public-Private Partnerships and the APEC Guidelines for Public-Private Action against Corruption. APEC’s program of Economic and Technical Cooperation (ECOTECH) is essential to achieving our objective of building capacity in a range of sectors in APEC economies. We reaffirmed our commitment to the Manila Framework, which serves as the basis for the implementation of the ECOTECH activities outlined in the Osaka Action Agenda. We welcomed contributions from economies to APEC’s capacity building programmes. We welcomed China’s proposal to host the 5th APEC Human Resources Development Ministerial Meeting in 2010. Ensuring that all members of our economies receive a quality education is critical to achieving social, individual, economic and sustainable development. It enables people to take advantage of the opportunities created by globalization. We supported the efforts of APEC Education Ministers to strengthen education systems in the region including ongoing support to the APEC Education Network. We welcomed the research-based steps taken by APEC in the areas of mathematics and science; language learning; career and technical education/technical vocational education and training; and information and communication technologies (ICT) and systemic reform. We support the recommendation of Education Ministers to facilitate international exchanges, working towards reciprocal exchanges of talented students, graduates and researchers. We reaffirmed our commitment to build regional capacity to minimize health-related threats including avian and human influenza pandemics and communicable diseases such as HIV/AIDS. We welcomed continuing efforts to ensure economies are well prepared to deal with health threats and to respond to them in a way that minimizes their adverse impacts on human welfare, trade and investment. We reaffirmed our commitment to improve food and product safety standards and practices to facilitate trade and ensure the health and safety of our populations. We endorsed the work of the APEC Food Safety Cooperation Forum’s Partnership Training Institute Network and called on Ministers to take additional steps to enhance food and product safety next year. We are concerned that gender discrimination continues to have a significant impact on our economies. We committed to strengthening the capacity of APEC members to ensure that gender considerations are taken into account in the development of trade and economic policy, and to ensuring that the region’s women are better able to participate in and benefit from regional and global trade. Enhancing human security and protecting the region’s business and trade against natural, accidental or deliberate disruptions remains an enduring priority for APEC, and an essential enabling element in APEC’s core trade and investment agenda. We agreed that international terrorism and the proliferation of weapons of mass destruction and their means of delivery pose a direct threat to our vision of free, open, peaceful and prosperous societies, and reaffirmed our commitment to eliminate these threats. Since 2001, we have worked together with a common understanding that all terrorist acts are criminal and unjustifiable, and must be unequivocally condemned, especially when they target or injure civilians, or use the abhorrent practices of suicide bombing and hostage taking. Terrorism in all forms and manifestations, committed by whomever, wherever and for whatever purposes, is a profound threat to the peace and security of all people, and of all faiths. Terrorist acts cannot be excused or justified by any alleged cause, conflict, oppression, or poverty. We agreed that terrorist attempts to abuse or corrupt trade flows, finance, transportation, travel communications and modern technologies will not be tolerated. We pledged our full cooperation to ensure that the flow of people, goods and investments remained secure and open, and that economies and markets operated without disruption. We welcomed the initiative of a group of member economies led by Singapore to undertake a Trade Recovery Programme pilot exercise in 2009. We recognized the important role played by the UN and its Global Counter-Terrorism Strategy. We stressed the need for implementation, where applicable, of UN counter-terrorism measures and the Financial Action Task Force’s (FATF) Special Recommendations on Terrorist Financing. We urged APEC Ministers and officials to continue to help secure the region’s economic, trade, investment and financial systems from terrorist attack or abuse and trade-based money laundering. We welcomed the ongoing efforts of the international community to combat piracy and armed robbery at sea and encouraged further concerted efforts to fight against piracy. The frequency and intensity of natural disasters related to the distortion of climate patterns in the region is increasing and the location of, and growth of, cities and mega-cities in vulnerable areas increases the impact of catastrophic events. Improving risk reduction, disaster preparedness and management in the region is a critical human security issue facing the region. We agreed that the challenges in this area are significant and growing in complexity and required greater international cooperation and coordination with the private sector, international organizations and non-government organizations. We recognized that there continues to be operational challenges in regional disaster responses and greater coordination is needed as the number of disaster management arrangements and players in the region continues to grow. We agreed that greater focus is needed on disaster risk reduction, emergency preparedness and building domestic disaster management capabilities. In this regard, we welcomed the adoption of an APEC Strategy for Disaster Risk Reduction and Emergency Preparedness and Response initiated by Peru; the APEC Principles on Disaster Response and Cooperation proposed by China; the Stocktake on Disaster Management Capacity Building Needs; and welcomed the Australia-Indonesia proposal for a Disaster Risk Reduction Facility and its linkages to APEC economies and the APEC Task Force on Emergency Preparedness. We endorsed the priority APEC has given to promoting risk management, business resilience and public-private sector partnerships, and supported efforts to prepare economies for the recovery phase. We instructed officials to undertake long-term capacity building projects aimed at accelerating recovery in disaster affected areas in APEC economies and supported the inclusion of education on disaster issues in school curricula where appropriate. Our ability to successfully confront the challenge of climate change will be crucial to the wellbeing of future generations. As a global issue, climate change must be addressed in a comprehensive manner, through international cooperation under the UN Framework Convention on Climate Change (UNFCCC) in 2009. Reducing poverty is likely to become more difficult in those developing economies most vulnerable to the adverse effects of climate change and related natural disasters. We reaffirmed our commitment to the Sydney APEC Leaders’ Declaration on Climate Change, Energy Security and Clean Development. We support decisive and effective long term cooperation now, up to and beyond 2012 to address climate change under the UNFCCC, in accordance with the principle of common but differentiated responsibilities and respective capabilities. We welcomed decisions taken by the international community at the UN Climate Change Conference in Bali in 2007 and the efforts to build a consensus on long term cooperative action, including a global emission reduction goal. We also noted the declaration in this regard by the G8 Hokkaido Toyako Summit held in July this year. We recognize the economic diversity and different domestic circumstances of individual APEC economies in addressing climate change. We reaffirmed our commitment to the Action Agenda announced as part of the Sydney Declaration. We appreciate and encourage the efforts of individual APEC economies to meet these goals. We also welcomed the establishment of the Asia-Pacific Network for sustainable Forest Management and Rehabilitation (APFNet) and appreciate China’s commitment to further financial support for this initiative. We expressed support for the cooperation and capacity building for climate change mitigation and adaptation, including those that promote the development and deployment of clean technologies. We appreciate Australia, Japan and the United States' financial support for the Climate Investment Funds, particularly the Clean Technology Fund. We recognized the value of conservation, sustainable forests management and land use practices and enhancement of carbon stocks in forests and agricultural soils for carbon sequestration in the global response to climate change. Recognizing that climate change could impede economies’ abilities to achieve sustainable economic growth and reduce poverty, we strongly support international cooperation and capacity building for mitigation and adaptation as objectives that should be equally pursued, including those that promote low-emissions technology development and transfer to, and financial support for, developing economies. We also call for additional and coordinated efforts to better understand vulnerabilities caused by the impact of climate change on our oceans and their resources to develop more effective adaptation strategies. We endorsed the positive contribution of the Major Economies Leaders’ Declaration to the UNFCCC. We committed to concerted action under the UN and complementary processes to reach an equitable and effective post-2012 international climate change arrangement at the UN Climate Change Conference in Copenhagen in December 2009. Conscious that access to adequate, reliable, clean and affordable energy resources is vital to sustaining economic prosperity in the region, we reaffirmed our commitment to supporting the energy needs of regional economies by promoting open energy markets and free energy trade and investment. Such markets are crucial to the development of renewable sources of energy and the dissemination of low emission energy technologies, including new and alternative energy resources and technologies. We encouraged our officials to promote such developments and urge them to pursue regional energy efficiencies and maximize the potential development of clean energy technology. APEC is the pre-eminent forum for economic cooperation in the region. We are committed to strengthening APEC’s institutional processes to ensure it remains responsive to a rapidly changing global environment. Cooperative action within APEC can contribute to better outcomes on the major international challenges we face. We welcomed advice from APEC Ministers on the successful establishment of a Policy Support Unit in the APEC Secretariat as well as progress on the appointment of an Executive Director of the APEC Secretariat for a fixed term. We endorsed in full the Joint Statement of Ministers at the 20th APEC Ministerial Meeting. We welcomed the offer of Indonesia to host APEC in 2013. We welcomed the invitation from the Prime Minister of Singapore to meet again in Singapore in 2009. Attached are fresh pictures of the beachfront and market in wonderful Kavieng, New Ireland province, where I just returned from today. The beachfront is unspoiled, and you can find the tastiest sea food and freshest vegetables at the Kavieng market. I spent the last couple of days in Kavieng for the National Fisheries College graduation and thoroughly enjoyed every minute of my stay. I'm planning to go back very shortly. other thus duplicating financial resources unnecessarily. He raised this concern last Friday at the graduation ceremony of seven students with their pioneer diplomas in fisheries and marine resource management at the Kavieng campus of the National Fisheries College. “One of Papua New Guinea’s major problems is greed,” Prof Siaguru said. “Each government department does its own thing and creates a lot of duplication. “A country that is united within can ride the external economic and political pressures much more comfortably, than a country that is disunited with each government department doing its own thing. Prof Siaguru revealed that other initiatives by the UoV to work collaboratively with the Department of Mines to students Papua New Guineans for the Rabaul Volcano Observatory and the Department of Education for Kokopo Business College “have bogged down because of greed from within”. “These government departments have been making excuses after excuses and have been stalling plans for collaborative joint training of PNG’s human resources,” he said. “Such lack of foresightedness to work together by the bureaucracy will multiply and duplicate financial resources unnecessarily, finance which this country cannot afford to waste. “The fisheries and marine resource programme is a fine example of good, sound and focused effort from National Fisheries Authority, GTZ, Office of Higher Education and the University of Vudal. Captions: 1.Tumbuans performing at the inaugural National Fisheries College and University of Vudal graduation last Friday. 2. Diploma students with guests after last Friday’s graduation in Kavieng 3. Dux of the graduating class Gove Francis receiving his diploma from University of Vudal chancellor Sir Rabbie Namaliu. 4. The official party led to the dais. 5. 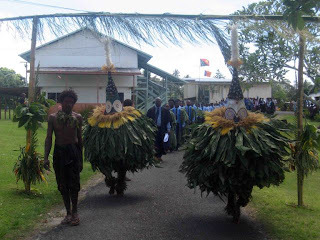 Tumbuans lead guests and graduating students at the National Fisheries College in Kavieng last Friday. History was made at the National Fisheries College in Kavieng last Friday when the first-ever diploma in fisheries and marine resource management students graduated. The seven students were Barry Glenda, Galuwa Augustine, Gove Francis, Jahak Leornard, Kenove Robert, Michael Jack amd Yasi Tava Mark. It was the result of a collaborative effort between the National Fisheries Authority, University of Vudal and the German Development Assistance Agency GTZ that has seen this programme bear fruit. Guests including UoV Chancellor Sir Rabbie Namaliu, New Ireland Governor Sir Julius Chan, NFA deputy managing director John Kasu, UoV vice-chancellor Professor Philip Siaguru and Dr Uwe Lohmeyer of GTZ were present for the occasion. Sir Rabbie said the graduation signified four momentous achievements. “Firstly,” he said, “seven young people will be graduating to take their place in the fisheries and marine resources sector, which is one of the most-important sectors in the Pacific region. “Secondly, it has brought together professionals from Germany, PNG and the Pacific nations to enable it to get this far. “These men and women must be complimented for the foresight and dedication provided to allow the first graduation to occur. “The third occasion is for this province, New Ireland, to host a university graduation ceremony. Sir Rabbie said that fisheries and marine resources were vital commodities for PNG and the UoV, in partnership with the NFA, could stand tall for the contribution they were making to the region and the international community. “Three years ago,” he said, “there were many critics who thought otherwise about this programme. “I am indeed happy to see that notwithstanding some obstacles, Vudal University in conjunction with GTZ and the National Fisheries Authority, is now graduating its first batch of trained technical scientists who have a job ahead. Sir Julius said UoV could have a greater impact and role in PNG and the Pacific as indicated by interest from neighbouring Solomon Islands. He said it was his vision that the NFC could follow suit and one day become a university of its own. “With foresight,” Sir Julius said, “I hope this college, which I helped launch 20 years ago, will one day excel beyond diplomas, degrees and become a campus of its own. The need to re-introduce the professional education program in the fisheries discipline at the university tertiary level has been very much triggered by the increase growth in investment in the PNG domestic fishing industry. The course was developed in a consultative process between the NFA including NFC, the UoV, the University of Papua New Guinea (UPNG) and GTZ. GTZ contributed to the program by putting together subjects relevant for the degree and diploma program while the rest was done by NFC, UOV and UPNG. A technical working committee was established since 2006 to annually review progress and work plans for curriculum development and coordination of the program. The committee consists of participants from key participating government institutions, namely GTZ, UOV, NFA, Office of Higher Education, UPNG, National Planning & Rural Development. Diploma and Degree in Fisheries and Marine Resource Management is a three to four years program respectively and courses are offered both at the University of Vudal, East New Britain campus and National Fisheries College-Kavieng. Year 1 and 4 students are enrolled at UOV and the second and third years’ courses are conducted at NFC in Kavieng.